Went to Clos des Gourmets last night with my friend Andy G. My wife and I had been there with friends for New Year's Eve and enjoyed it, but I wanted to return on a normal night to give it a more realistic test. The welcome is warm and the recently redone interior stylish, signaling good things to come. The food is classic French, well prepared and reasonably priced. There is no à la carte selection, just the 35-euro three-course menu which, it must be admitted, contains many dishes carrying supplements, generally 9.50 euros. We stuck with the basic menu and were not disappointed. I started with a delicious cream of lentil soup with a soupçon of truffle oil and some delicious thin bellota ham chips on the side. Rich and tasty, with earthy truffle notes. Andy G had the terrine of the day - pheasant - which was fine but not extraordinary. The terrine varies according to the luck of the hunt, and I would have preferred a gamier catch. I continued with a parmentier (mashed potatoes) of duck confit topped with a delicate mesclun salad. A beautiful and surprisingly sophisticated dish, where the three elements harmonized to great effect. Andy G had a perfectly grilled lieu (black cod) over an ethereally light puree of carrots. Classic desserts followed: a feuilleté with salted caramel and an individual Paris-Brest, both excellent. In sum, delicious, well-presented classic bistro fare - slightly modernized - with an amazing price/quality relationship. A bonus is the stupendous view of the Eiffel Tower from the Pont de l'Alma as you walk to the restaurant from the Métro (and on the way back). Clos des Gourmets, 16 avenue Rapp, Paris 7ème (Métro Alma-Marceau), 01 45 51 75 61. Last night I went to a simple but good restaurant in Paris and had the day's special (plat du jour): suprêmes de poulet aux morilles. It reminded me why the French think the breast is the best (hence suprême) part of the chicken: definitely not because it is lower in cholesterol than the dark meat but because, properly prepared, it is sublime. I hunted for the recipe on the internet and in the Larousse Gastronomique, but what I was finding didn't seem right. Then I found what appears to be a perfect version in my old paperback copy of Julia Child's French Chef Cookbook, which features recipes made on her iconic TV show. The preparation is quick and easy, unlike many of Julia's: just (i) saute the mushrooms in a casserole in butter, (ii) add the chicken and poach in butter covered with parchment paper in a 400 degree oven for a few minutes, and put aside while keeping warm, (iii) add white wine to the sauce and reduce, then (iv) do the same with some cream. The key to success will be to start with really succulent tasty chicken breasts: while French quality chicken is hard to find in the US, we are far better off than when Julia wrote this in the '60s, and a really good farm-raised chicken should do nicely. I plan to try this when I return to NY. My wife and I tried it this week with a fennel and sausage sauce (using Italian style chicken sausage, mild and hot mixed together, to keep the dish healthful), and the results were striking. 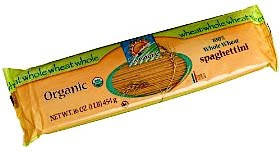 While it has some whole wheaty characteristics, it is really more like plain, only more so. Just delicious pasta that happens to be better for you. It's available on line if you have trouble finding it. 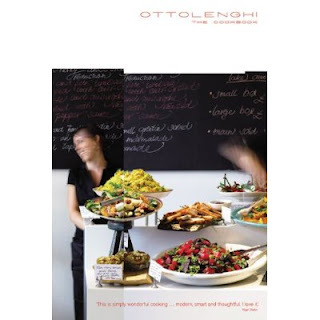 A friend who is an avid collector (and user) of cookbooks recently recommended Ottolenghi: The Cookbook, and it is indeed an extraordinary book. The book represents a collaboration between Yotam Ottolenghi, a Jewish man from West Jerusalem, and Sami Tamimi, a Palestinian from East Jerusalem. They have four popular casual restaurants and take-out shops in London, and their little empire is growing. The book, which seems to be a cult cookbook in England, contains recipes for favorites from the restaurants. The collection is eclectic, with Middle Eastern influences, to be sure, but many other strains of influence as well. The result is an exciting book of recipes that are not like others you have made. I was so taken with the first section, entitled "Vegetables, Pulses and Grains" that I read the book from cover to cover. Among the enticing dishes: french beans and mangetout with hazelnut and orange; bakes artichokes and fava beans; roasted butternut squash with burnt aubergine and pomegranate molasses; fennel, cherry tomato and crumble gratin, Jerusalem artichoke and rocket soup . . . well, you get the picture. The tempting recipes are lavishly and appetizingly illustrated. The only problem is that measurements and certain ingredient names (e.g., rocket, aubergines, mangetout, pimentos) are in British, not American, English, but this is not a major problem. I have made only a couple of the recipes, but both were successful. Do get this book, which is easily obtainable through Amazon.